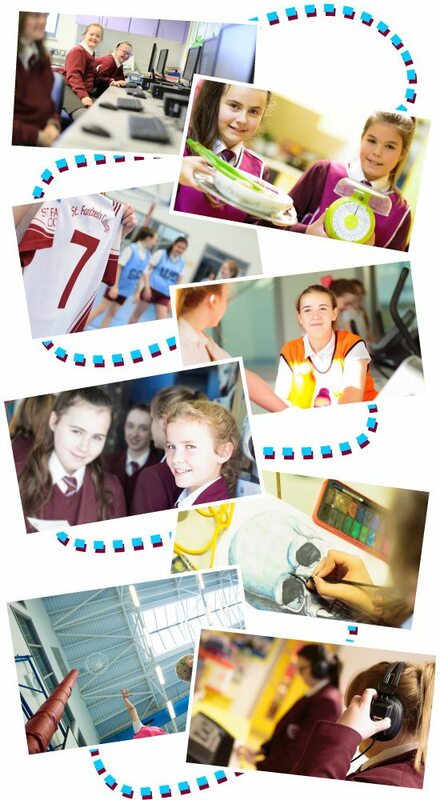 Within the timetabled curriculum, pupils from Years 8 to 10 are allocated three periods per week and Years 11 and 12 have two periods per week for Physical Education where they are afforded the opportunity of participating in a range of sports and sports activities. Physical Education classes consist of gymnastics, athletics, dance, fitness room training, and a variety of games. Indoor facilities include a Fitness Suite, Gymnasium Hall, and Sports Hall. Outdoor facilities include an all-grass playing field, an all-weather pitch and four tennis courts. Extra-curricular training in Netball, Gaelic Football and Athletics prepare the pupils for competitions. In addition to these activities pupils participate in community programmes in dance, rugby, basketball and soccer. Trips are organised annually to develop social and physical skills through orienteering, climbing and water sports. The college has won local titles and has had students representing the district and province in various sports. Music has always been an intrinsic part of college life in Saint Fanchea’s. Music tutors from the Music Service (EA Western Region) provide instrumental tuition in brass, woodwind and strings and the college also avails of the services of a specialist in Irish traditional music. Trips are organised to musical productions in Belfast and Dublin. Pupils who enjoy choral or instrumental music can join the college choir which rehearses weekly. The choir has performed in UTV School Choir of the Year, Feis Fhearmanach, college concerts, Songs of Praise (BBC) and at college and parish liturgies. Tuition is available for drums, guitar and traditional instruments. Each of our pupils are encouraged to fulfill their creative potential through a range of opportunities that include drawing, painting, ceramics, graphic design, textiles, printmaking, tie dye, batik and hand and machine stitching. After school Art & Design sessions are offered to Year 12 students each Monday from 3.30-4.30pm. Pupils’ work and achievements are celebrated and highlighted with prominent displays of work in both two and three dimensions in the classroom and throughout the college building. Participation in Feis Fhearmanach is a yearly highlight in the college’s social calendar. Pupils participate, with great success, in such varied events as solo and choral verse speaking, drama, oral and written history, solo and choral singing, art and instrumental music. Pupils also participate in creative art projects and have been very successful in the Fermanagh County Show and in competitions organised in the local community. The college has participated in the BT Young Scientist and Technology competition over a number of years, reaching the final on four different occasions. Two Year 9 pupils achieved second place in the Junior Physical Sciences and Mathematics category in January 2013. Carefully planned and supervised cultural, sporting and curriculum-related trips, both within Ireland and abroad, are a normal part of life in Saint Fanchea’s and are open to all pupils. Saint Fanchea’s operates a student council which aims to develop the college community so that pupils can become co-partners with teachers in their education. In tandem with the Citizenship curriculum, the council introduces pupils to democratic, responsible and mature ways of expressing views and debating issues that impact on their education. Every academic year, each form class group from Year 10 to Year 14 can nominate a representative for the student council. This council convenes every two weeks and gives our pupils a real and meaningful opportunity to influence and shape college structures and activities. Throughout the year the college community gathers for prayer three days each week at morning assembly. The Sacraments are also celebrated at key liturgical times of the church year. Masses are celebrated throughout the college year. The Sacrament of Reconciliation is celebrated during Lent. Para liturgies and prayer services are regular events where pupils can express and experience their faith through prayer.